Since last week’s accidental trip through Mardi Gras, I have a new appreciation for Fat Tuesday. 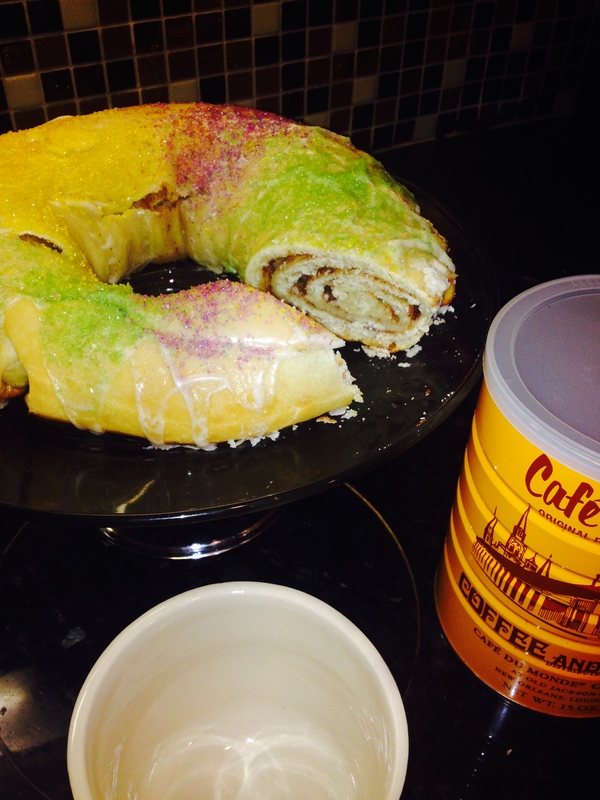 I tried a few different recipes for Traditional King Cake–even fashioning one myself–but this one from Southern Living was the best. I liked that it wasn’t too sweet, and it made two loaves. Part of my Lenten journey this year is to improve my passive-aggressive relationship with yeast, so with this recipe, I can start a day early. Pair this with a pot of Cafe au lait–brew a pot of coffee with chicory, 1 tablespoon per cup of water–and then bring a small saucepan of whole milk to almost a boil. Fill the cup half with hot coffee and half with hot milk and then sweeten as desired. It’s a warm way to start the next forty days.